Ohh, la la. Hammy, cheesy, melty, tasty. Last Sunday I posted a recipe for making jam out of the fruit of flowering quince. At some point I had to do something that would force me to use some. This was it. And a fine choice it was. I love these sandwiches. I guess it’s partly because I love French toast. Some people are more comme ci, comme ça about it. Regardless, French toast is really more of a breakfast food. For a light lunch you have to add a little something to it. Those little somethings are ham and cheese. 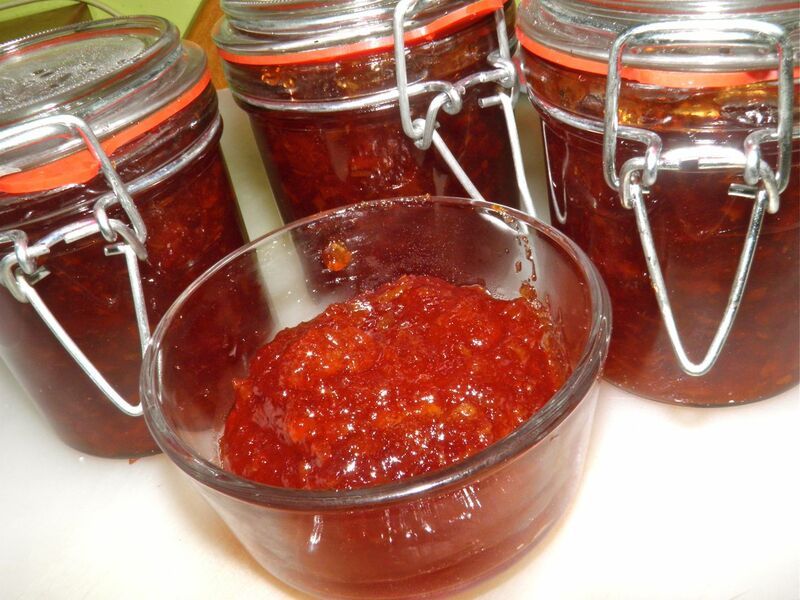 My homemade flowering quine jam. Croque-monsieur always have either Emmental or Guyère cheese, but there’s a lot of different options you can try to spruce it up. Serve with an egg on top (for a "madame"), or a slice of tomato ("provençal") or with a slice of pinenapple (Hawaiian). If you find yourself in France you can go to McDonald’s and order – are you ready – a Croque McDo. Hmmm. I think I’ll make mine at home. They’re not rocket science. This recipe uses Emmental cheese. It’s sometimes confused with Swiss Cheese in North America. Emmental comes from a specific region of Switzerland. North American Swiss cheese – usually not quite as flavourful – can be made anywhere. Our attempts are usually made from inferior ingredients so the taste isn't as "full." Emmental melts very well so it’s one of the two cheeses often used in fondue and in grilled cheese sandwiches. 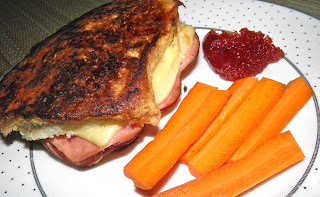 We’re making glorified grilled cheese sandwiches today. So if you can, get Emmental. There's always a dollop of jam on the plate when I serve these. The quince jam was perfect for lunch. 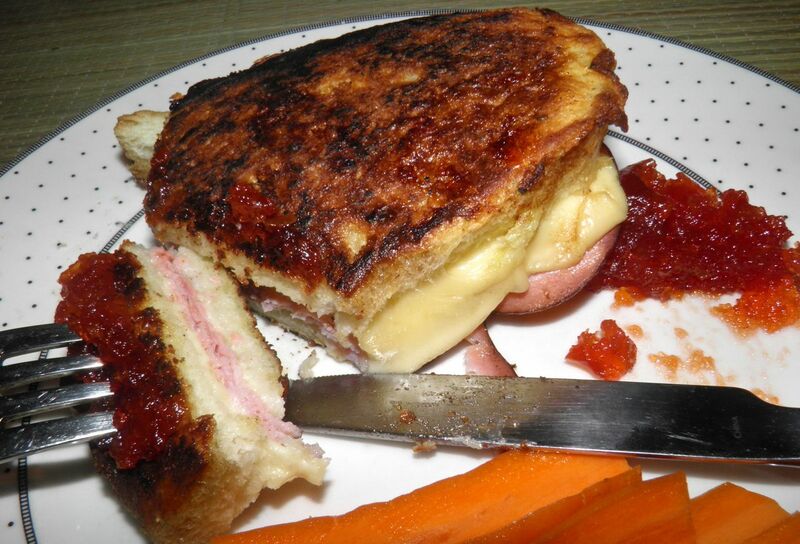 The jam itself is not too sweet so it paired extremely well with the ham and cheese. No wonder I like these so much. Preheat the oven to 350°F. Melt the butter in an oven-proof skillet. Mix the egg and cream together on a plate. Add salt and pepper. Pair up the slices of bread. Place 1/4 of the cheese slices on two pieces. Follow that with 1/2 of the ham and then the remaining cheese. Close each sandwich with the remaining slices of bread. Take each sandwich and dip into the egg mixture. Let it soak for a few second and then flip and repeat. Place each sandwich in the hot butter and let cook on each side until golden. After each side has browned place the pan in the oven and let cook until the cheese has melted, about 15 minutes. Serve with the jam of your choice.